After the dreading market sell-off in October, my portfolio jumped and returned about 11% in November alone, rising like a phoenix after getting burned. It was quite an emotional roller coaster seeing my portfolio value going up and down by more than C$3,000 within 2 months. Now the portfolio gain is OVER C$16,000!!! In past articles, I only compared my portfolio with S&P500 but I will add Nikkei 225 and S&P/TSX60 as benchmark from now on. I figured it may provide a better insight since I invest in American, Japanese and Canadian stocks. You can see that my portfolio (Blue) is still beating all three benchmarks (US: Green, Japan: Purple, Canada: Orange). There were some notable changes in the portfolio. Since the call option on CVS was going to expire in January, I was looking for a good time to close the positions before the expiry. Thinking that the stock may have approached a near-time psychological top (No data to backup, my pure instinct), I made the move when the stock price hit near $81. I purchased two call options when the stock price was near $72. I ended up realizing about U$750 gain from about U$2,000 investment (The figures may be a bit off, I’m writing this off top of my head). Not bad but it’s an ok result considering the amount of risk I took It could’ve expired with 0 value (thus U$2,000 loss) depending on the price movement. I probably should stick to regular stock purchase or shorting put options… I’d have to say I got a bit greedy in this trade and somewhat speculated (i.e. a gamble). As I wrote in my valuation article, I believe it’s a good stock to own as a long-term investment. I will go into a long position again if we face another market sell-off. As I wrote in my another valuation article, I believe Garrett stock is a great investment at price below $14. When the stock price dropped to near $13, I shorted put options with the strike price of $12.5 and December expiration. Netting the premium of the put options, my average effective purchase price of the stock became about $11.5. The stock is now also trading at $11.5 so I’m pretty much at break-even now. I’m looking into averaging down if the stock price drops further. If my investment thesis is correct, the stock could double or triple within 5 years or so. IT’S ALL OR NOTHING! (Just kidding, my portfolio is decently diversified for the moment). To hedge against a potential market meltdown, I entered into a short-term bear put spread position (Long put at 2,600, Short put at 2,400, February expiry). If the market keeps going up in future, I may add more positions with longer maturity. For those who don’t know what bear put spread is, I may write an article on it later. Are you curious how my portfolio may perform in long-term? SUBSCRIPE AND STAY TUNED!!!!!!! October was certainly a toughest month of my portfolio. The whole market seemed to experience the pain. As the market dropped, my portfolio also took the hit as seen below. Although it was still quite painful seeing my portfolio decrease in $1000’s of value in one day or two, I shouldn’t care about such short-term drop as a long-term focused value investor. As long as the underlying business is solid, the individual stocks should perform well in the long-term. Fortunately, there were some positive development in the underlying businesses of the stocks that I own. I believe these companies can survive and thrive in future even if we face an economic downturn in near future. Gran Colombia Gold has grown its trailing 12-month production volume by 23% from 2017 and improved its credit rating. The increased production will increase their cash flow and the improved credit rating should decrease their borrowing cost in future if they need to raise more capital for mining expansion projects in future. Even if the economy collapsed, the company should do well as long as the gold price holds the current level. If the gold price increases, that’s a bonus. Willplus owns and runs multiple car dealerships in Japan. The company announced that it acquired a Porche dealer in the beginning of October. The company has a stringent criteria in choosing its acquisition and has a great track record of improving the performance of the acquired dealers. The acquisition should add more fuel to the company’s growth. If there is an economic downturn, the company can buy more troubled dealerships at bargain price, turn them profitable and enjoy the accelerated growth during the economic recovery. This is how the company grew rapidly since the financial crisis and I believe the same strategy should work in the next upcoming crisis. There was another 0.25% BoC rate hike near the end of October. If RBC can successfully increase its net interest margin and the residential mortgage remains stable, it should help them increase its earnings from the retail banking sector. I may need more research on this topic but based on my understanding, the bank’s capital market division should be able to benefit from the recent volatility of the market. If I remember correctly, the capital market division includes a trade function and the volatile market condition somehow helps them make profit (I suppose they do something like swing trade?). I somewhat fear that the profit from wealth management division may somewhat decrease as the recent drop in the market may spooked some of investors and may have decreased the volume of the division’s asset under management, which decreases the fee income. I’ll need to watch out for the number in the Q4 earnings release. RBC’s CET1 Ratio, a ratio which shows the level of the equity buffer again the amount of the bank’s risk-weighted asset, is 10.9% as of 2018Q2, which is more than double of the current minimum regulatory hurdle of 4.5%. The bank should have enough buffer to survive during an economic downturn (unless they found loop holes or tricks to lower the risk-weighted asset…). Keep following my blog to see if how these companies will do in the long-term! Subscribe and stay tuned! 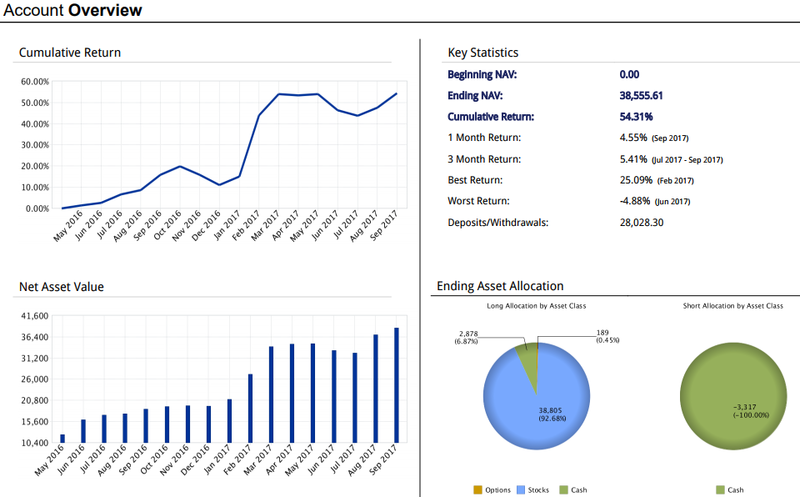 Building on the incredible growth in February, my portfolio return has continued to increase throughout March. 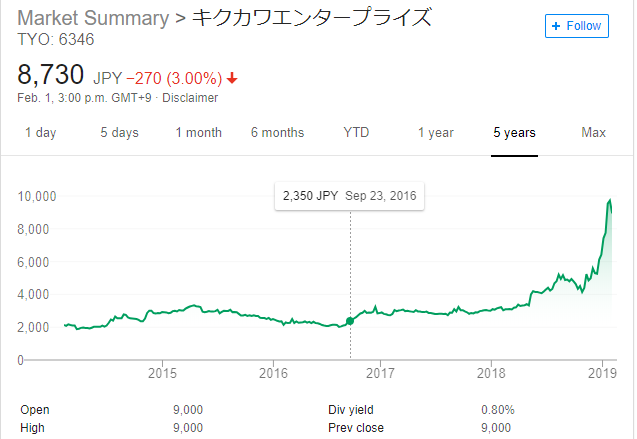 The price of Willplus Holdings (Ticker: 3538, Tokyo Stock Exchange) continued to increase. Though the stock has provided 250% return since the purchase, I still intend to hold the stock as the company has a decent growth prospect (potentially doubling their earnings in the next several years). The return of Canadian stocks has been mediocre comparing to Japanese stocks. I still have high hopes for Gran Colombia Gold (Ticker: GCM, Toronto Stock Exchange) as the company's balance sheet has been improving. Let's see how this one plays out. I have two investment accounts, one with Interactive Brokers and another with Virtual Brokers. I will discuss the returns of each portfolio separately. Since Trump won the election, it has been quite a rough ride for my portfolio. I added Gran Colombia Gold (GCM.TO) stock and Fairfax Financial Holdings (FFH.TO) right before the election result, thinking that the gold price will increase and the market will crash if Trump had won as I mentioned in this article. Unfortunately, it was the complete opposite. You can see how much my return dropped since November 2016 (My portfolio return: blue line, S&P 500: green line). It just reminded me that speculation of market condition is generally a bad idea. You can see that all other stocks, the ones that didn't involve speculation, are doing quite well. The return of Japanese stocks was especially phenomenal at 24.78%. Though I failed at speculation/market timing, I'm not too worried about Gran Colombia Gold (GCM.TO) and Fairfax Financial Holdings (FFH.TO) in terms of the long-term performance. I expect the return of GCM to be spectacular as long as the gold price hovers around $1200 per ounce as discussed in this article. The investments made by Fairfax are long-term focus and the company has a great track record of compound annual growth of 20.4% in book value since 1985. The return of Virtual Brokers Portfolio has been better than the market. I'm quite confident about the value including Becker Milk, E-L Financial Corp, Torstar Corp, Rocky Mountain Dealership, Noranda Income Fund and Gran Colombia Gold. I'm somewhat iffy about Hammond manufacturing co, ltd. Even though the stock is cheap, I haven't done enough research on the stock. The rest of the stocks are non-value stocks. I bought them when I first started investing, before I learned value investing. I might get rid of some. 2017 will be an interesting year. There are many political events in major EU countries including Italy and Germany. Trump will actually start his presidency. US Federal Reserve might keep increasing the interest rate. Let's see how many portfolio will do over the next year. Update on the performance of my portfolio. Come visit VSB and learn how to beat the market!